I’m Ed Smith, an experienced Sacramento truck accident attorney. An accident with any large truck, whether a big rig, garbage truck or cement truck, can result in devastating injuries or the death of someone you love. This is generally due to the large size and weight of a big truck. 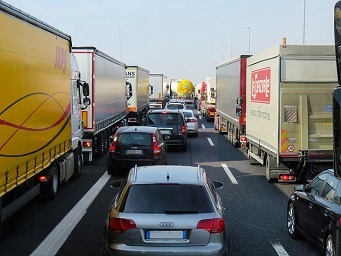 Following are some of the types of truck accidents and the reasons for them. Jackknifing occurs when a truck hauling a trailer folds up like a jackknife. This is caused when the trailer is moving at a speed faster than the tractor pulling it. There are numerous reasons this happens such as an inexperienced driver, weather conditions, improper braking or some type of equipment failure. When a truck jackknifes, it can result in a multiple-vehicle collision. Underride accidents occur when a smaller vehicle is too close, and the truck driver suddenly slows or has to stop in an emergency. This can cause the vehicle behind to pass underneath the truck. Most underride accidents result in fatalities since the top of the vehicle is sheared off when it passes underneath. Watch Youtube Video – Rear underride accidents. This video investigates the tragic loss of two young girls who were killed in an underride accident when one big rig rear ended the passenger car their mother was driving and pushed their vehicle into the back of another big rig. The mother of the two girls, who passed away, has been instrumental in bringing attention to this type of accident and helping to bring about design changes to big rigs that reduce or eliminate similar deaths. Load shifts are dangerous in a large truck. When a load shifts suddenly, it can result in a rollover and cause injuries to both the driver and those in vehicles who are struck. Improper loading can also result in part or all of a load being lost and landing on the road, creating a serious road hazard. However, the driver isn’t always responsible for loading the truck. In some instances, trailers are loaded and sealed in advance, without any input from the driver. When this happens, the company employing the driver can be held responsible for any injuries or deaths that happen in an accident. Many motorists don’t realize that large trucks have blind spots on all sides. It is difficult for a truck driver to see a vehicle that is directly in front or in back. Trucks that are hauling trailers also have a large blind spot on the left side that can encompass most of the length of the trailer according to the California Driver Handbook. The right side is even worse, with the trucker’s blind spot extending not only down the length of the trailer but encompassing several lanes. The easiest way for another motorist to stay safe when driving near a large truck is to give it plenty of room, and stay out of those blind spots. If you have to pass, don’t dawdle and maintain your speed. Allow plenty of room if you are reentering the lane so the truck driver can see you. From head and brain injuries that result in long-term hospitalization to spinal cord damage and internal damage, medical expenses related to the crash with a large truck pile up. Because of the complexity of accidents with large trucks, finding a lawyer with experience in truck accidents is important for an injury victim to obtain needed compensation to cover those expenses. I’m Ed Smith, an experienced Sacramento Truck Accident Attorney. When you’ve been hurt or you’ve lost a family member due to a negligent truck driver or trucking company, reach out to me. You can call . My free and friendly advice is waiting for you. Outside the calling area, you can access my toll-free number at (800) 404-5400. Or, if you prefer use this form to reach out to me online. It has been my honor to have served injured residents of Sacramento and the surrounding area since 1982 with numerous traumatic injuries and to obtain compensation for the loss of a loved one in wrongful death cases. I am a Million-Dollar Advocate from the state of California. This group is compiled of attorneys with million-dollar case settlements or verdicts for their clients and is composed of the top 1-percent of trial lawyers around the nation. A crash involving four vehicles on the Capital City Freeway at 1:00 p.m. left one person trapped and another injured after a collision with a big truck. The accident on April 3 occurred midday in the area of N Street. The incident blocked several lanes of traffic. The Sacramento Fire Department was called to the accident site. One injured person was taken to a local trauma center. It was reported the person was admitted to the hospital for treatment. Rescue personnel was working on freeing the trapped individual. An SUV involved in the accident was crushed in both the back and the front. As of the time of this report, little additional information has been released about the crash, and there is no word on how it happened.